Krystal 19 - The Aroma Fairy website. A retired lady who makes Aromatherapy items. Pillows cuddlies cushions - all unique with each infused with a selected blend of Essential Oils for sleep, relaxation, rebalancing, stress, or just to enjoy. And now, Rice filled Heat Packs infused with French Lavender which are ideal for therapy, pain relief or just to sit and enjoy the heat and comfort..Made with soft fleece backings to snuggle into. Sewing is my hobby, but the benefits of Essential oils are my passion. I concentrate upon the aromatic benefits of the oils, which I am constantly researching with the help of my friends in Homeopathy and the fields of conventional medicine. The oils I use are Essential Oils the best quality I can find, and I am constantly making new blends. Aromatherapy Wands are my latest product after much research and trial, great for Migraine Relief. Sinus Congestion, Nausea etc please look at my product range. 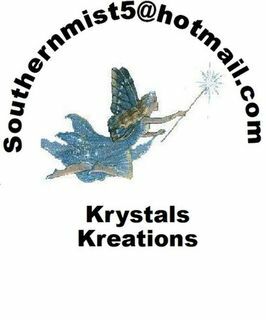 Krystals Kreations Products. I have a large range of materials available and I am constantly adding new ones. If what you want isn't listed, please email me, I may be able to help.